Florida Republican gubernatorial candidate Ron DeSantis, left, speaks about his Democratic opponent Andrew Gillum during a CNN debate on Oct. 21, 2018, in Tampa, Florida. 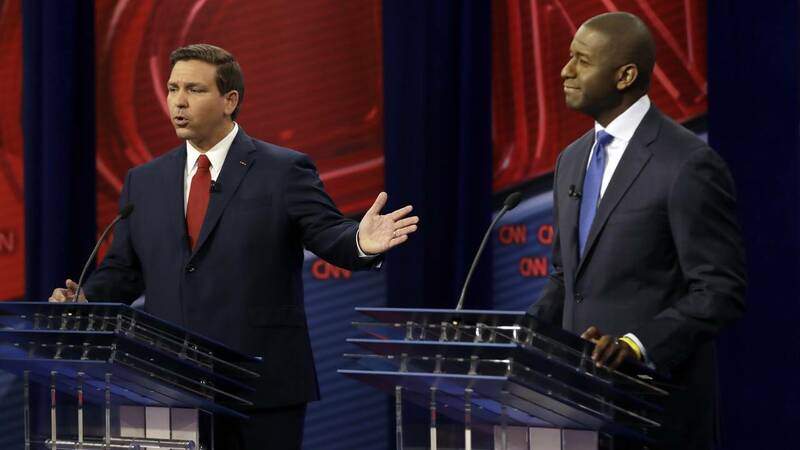 (CNN) - Hours after a new CNN poll found him trailing by double digits in their race to become the next governor of Florida, Republican Ron DeSantis leapt out of the gates to attack Democrat Andrew Gillum in his opening remarks at their first debate. DeSantis, a former GOP congressman who resigned to focus on this contest, began the CNN debate by calling Gillum a "failed mayor" and alleging that he was "involved in corruption" before the Democrat had a turn to speak. "Well, that was a mouthful," Gillum, the mayor of Tallahassee, deadpanned in response. Few campaigns in 2018 have run so directly parallel to the broader national political fight -- and this, like so much else in the era, had the feel of a brawl. DeSantis spent more time on the offensive, perhaps feeling he needed to change the trajectory of a campaign that's found him consistently on the back foot, while Gillum sought to downplay accusations of impropriety, while talking up his health care plan and casting himself as the more competent choice to lead the state. The rapid-fire, one-hour debate kicked off with a sharp exchange -- initiated by CNN's Jake Tapper, who moderated from Tampa -- over climate change and its outsized effects on a state that was slammed only a couple weeks ago by yet another devastating hurricane and is currently at war with a harmful algae bloom. DeSantis denied claims he denies the science behind the issue, saying, "I don't want to be an alarmist. I want to look at this and do what makes sense for Florida," and touted his recent endorsement by the Everglades Trust. Gillum, who has the backing of the Sierra Club, called the Republican "an election year environmentalist." "What Florida voters need to know is that when they elect me governor, they are going to have a governor who believes in science," he said, "which we haven't had for quite some time in this state." DeSantis was also forced to confront concerns that he has tried to use Gillum's race against him. The most high profile incident came in the first 24 hours after the primary, when DeSantis went on Fox News and warned Floridians not to "monkey this up by trying to embrace a socialist agenda" and voting for Gillum, who stands to be the state's first African American governor. The Republican vigorously denied that his comment was about race, saying, "Floridians can know that I'll be a governor for all Floridians." Gillum responded, "He has only continued in the course of his campaign to draw all the attention he can to the color of my skin. The truth is, I've been black all of my life. So far as I know, I will die black." Though his upset victory in the primary was driven by an endorsement from President Donald Trump, DeSantis sought to keep some space from the President, never quite answering whether he considered Trump a good "role model," and instead talking up the administration's decision to move the US embassy in Israel from Tel Aviv to Jerusalem. "Donald Trump is weak," Gillum said. "And he performs as all weak people do: they become bullies and Mr. DeSantis is his acolyte. He's trying out to be the Trump apprentice at every turn. He's tweeting at him and he's talking to him. He's showing up. He's complimenting him." After the face-off ended, Trump tweeted to declare for DeSantis "a great debate victory tonight against Andrew Gillum." Early on in the course of a rollicking hour, the candidates also broke into a heated exchange over suggestions from the DeSantis camp that an ongoing FBI investigation into public corruption in Tallahassee has implicated Gillum in wrongdoing. Gillum has repeatedly said that FBI told him he was not a focus of the probe, which centers on the relationships between developers and lobbyists in the state capital, including one with longstanding connections to Gillum. In the course of the investigation, Gillum once unknowingly attended the Broadway hit musical "Hamilton" in the company of an undercover agent. "Did you pay for the Hamilton tickets?," DeSantis asked. Gillum insisted he's always paid his own way as he came up as a young political star, but never directly answered DeSantis. His campaign has said the ticket was given to him by his brother Marcus, who attended the show with him, the agent and a lobbyist friend, Adam Corey, who volunteered as finance chair on Gillum's 2014 mayoral campaign. "We all have friends that sometimes let us down," Gillum said of Corey, while also pushing back at DeSantis with a suggestion this, too, was a racial dog whistle: "I'm a hard working person," he added. "I know that may not fit your description of what you think people like me do." The candidates' exchange over health care was less bruising, but pushed DeSantis into a political corner inhabited by many Republicans this midterm season, as he effectively pitted himself against the party's own efforts to dismantle Obamacare. Though those efforts, both in Congress and the courts, succeeded in changing the law and ending coverage regulations for people who have pre-existing conditions, DeSantis said, he would push through statewide legislation to counteract them. "I will sign a bill to take care of people with pre-existing conditions," he said, before pivoting to jab repeatedly at Gillum's support for "Medicare for all" single-payer health care. DeSantis warned that it would end current programs, many of them popular -- which is true, though single-payer advocates argue the replacement would be more comprehensive. Gillum flinched a bit, not defending the program which is a non-starter in Florida and most states around the country, instead seeking to talk up his plans to expand Medicaid under Obamacare. DeSantis opposes that, but has not yet released a health care plan of his own. His campaign website's "issues" page makes no mention of it.